Last week, it was a slow trickle leak. This week, the leak rate increased and now muddy water is coming out from the ground beneath the tarmac - I suspect that it is a progressing leak from a mains supply of sort. A case of water wastage, and risk road damage or even a sink hoe developiong if left as is. Thanks for investigating this ASAP. 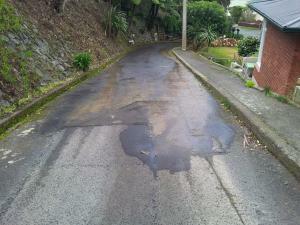 Correction: A case of water wastage, and risk of road damage or even a sink hole developiong if left as is.